The geographical areas for cultivation are quite varied, but coffee is traditionally an equatorial crop. The type of coffee (Arabica vs. Robusta) will have some impact on where it is grown. Each country produces varying yields. Brazil produces close to 6 billion pounds while Zambia produces 264,000 pounds or .004% of Brazil’s annual yield. Coffee trees are an evergreen shrub, ‘genus Coffea’. The two main strands are Coffea Arabica and Coffea Robusta. An Arabica plant is a large bush with dark green leaves and its cherries (the fruit that contains the coffee beans) take 7-9 months to yield. Robusta plants look more like a small tree and can be quite tall; they take slightly longer to mature. Mechanical harvesting in these austere environments is not always feasible because the trees can be easily damaged, preventing yield for multiple harvests. Therefore, coffee is often picked by hand. Pickers will wither strip the trees of all their cherries or pick only ripe fruit for higher quality coffees. The coffee is then processed. A coffee cherry contains two beans surrounded by parchment. The initial processing is broken down into two methods – dry and wet. 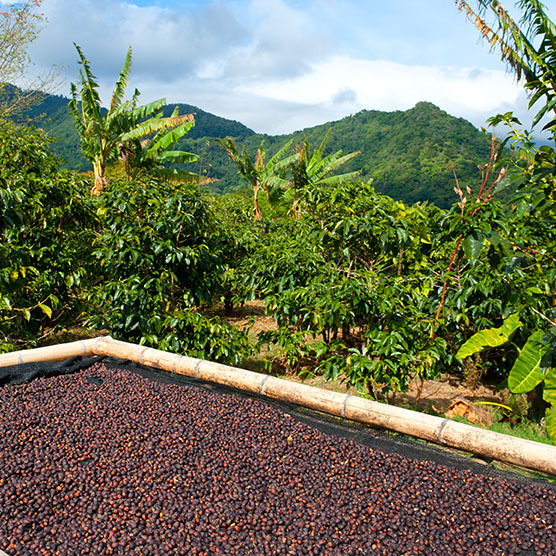 In dry method coffee processing, the cherries are cleaned and then laid out to dry in the sun. During this process the cherries are raked and turned to ensure even drying. Once dried, the fruit is siloed until husking. Wet method requires specialized equipment and access to water. In this process the cherries are pulped so that the cherry and bean separate, the bean is left with a slippery skin and parchment covering. Beans are then cleaned again and put in large tanks where the slippery coating is broken down. Parchment is then dried to reduce its moisture content to the desired levels. The beans are then hulled (parchment is removed), screened, cleaned, sorted, and graded prior to sale. Central America produces coffees that are particularly suited to the American palate. These cups have mellow acidity with chocolate and caramel flavors. Special mentions include: Guatemala, Honduras, Costa Rica, El Salvador, and Panama. Colombia deserves special mention when describing broad growing regions for coffee. Colombian coffee is very dynamic, its flavor is unique amongst great neighbors for its acidity, often very strong, and its floral notes. Besides Colombia, South America’s other great coffees come out of Peru and Ecuador (see below for Brazil). At one point Venezuela produced great coffee but now produces less that 1% of the worlds crops. Brazil is a coffee-producing giant, so its flavor output is quite varied. Chocolate and spice are typical flavor characteristics, but these flavors don’t always make for the cleanest cup. These beans do, however, make phenomenal blends, and bring out other characteristics in their complimentary coffees. Ethiopia, the original source of coffee, is considered the best cup by most of the industry. Good Ethiopian beans are fruity and almost wine-like, but can often exhibit floral and tea-like characteristics in some cases. Both Ethiopia and Kenya are known for their juicy coffee. The prized Kenyan crops SL-28 and SL-34 are some of the rarest coffees in the world (if you find any we have dibs). The stark differences between methodology and growing conditions in Africa vs. South and Central America creates distinctions that are easily perceived. Vietnam has grown to be the second largest exporter of coffee in the world, behind only Brazil. It started its coffee production in low grown Robusta trees but has expanded into higher quality Arabicas in recent years. Indonesia and Papa New Guiana (PNG) are two of the most popular Asian coffees. Both are known for strong acidity and earthy flavors.